Note: We apologize for the delay on this product. Our Quality Assurance Team is currently screening for a clean lot of this item. At this time we have no estimated date of availability and will post an update as soon as we know. We do appreciate your business with us and your patience while we complete this process. As our world becomes increasingly polluted, it's very rare to find certified organic bee pollen from clean sources. The Health Ranger's Organic Bee Pollen comes from carefully selected beekeepers in Spain, and it's 100% certified organic, non-GMO, wheat-free and dairy-free. It has also been tested in our private laboratories and found to be extremely clean. Organic bee pollen is one of Mother Nature's most potent superfoods: It's approximately 40% protein (richer than any animal source!) and packed with amino acids, minerals, B vitamin and folic acid. This is one of nature’s most completely nourishing foods, as it contains almost all the nutrients your body needs. The Health Ranger's Organic Bee Pollen is ideal for supporting commonsense weight management, for providing an energy boost and for supporting recovery from strenuous activities like exercise. 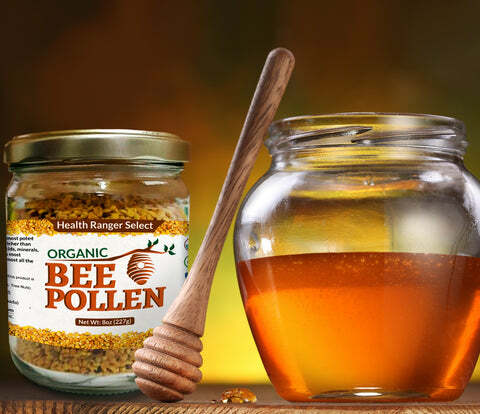 Our Organic Bee Pollen has a delicate aroma and a sweet and slightly floral taste. You can eat it directly from the jar, as a highly nutritious and healthy snack, sprinkle it on porridge, breakfast cereal, muesli or blend it into smoothies and desserts. "Bee pollen is at the top of my list of the world's most nutrient-dense superfoods," says the Health Ranger. "It's a true powerhouse of nutrition, and when it is ethically and sustainably sourced, it helps promote pollinator stewardship while substantially boosting the nutrition of those who have access to this phenomenal superfood resource." Bee pollen is really flower pollen that's collected by bees. It's harvested by encouraging honey bees to drop a small percentage of the pollen they've gathered, while allowing them to keep plenty of pollen to nurture their own hive. Purchasing bee pollen helps make honey bee stewardship more abundant and successful for the small business "farmers" that care for the hives. The more money they can earn from selling bee pollen, the larger bee populations they can support. During the collection of bee pollen, honey bees are also pollinating flowers and food crops! These statements have not been evaluated by the FDA. This product is not intended to treat, cure or diagnose any disease. Manufactured in a plant which may contain nuts (Peanuts, Tree Nuts). Explore More About Organic Bee Pollen Now! This means the product has been tested via ICP-MS and confirmed to meet the limits for an A++ rating as described at LowHeavyMetalsVerified.org.. Copyright © 2019 Health Ranger Store. All Rights Reserved.